The waterfall braid also known as the cascade braid recently exploded as the new "trend braid" of the season. The waterfall effect looks cool and complex, but it's easier to style than you think. 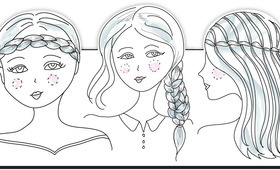 Give this beautiful braid a try when Beautylish takes you through the how-to! The waterfall braid works best on straight or loose waves. Brush out all the knots with a wide tooth comb. 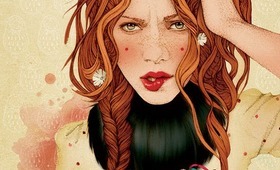 Part your hair how you normally would, and begin your braid on the right side of your part. Grab the top section and divide into three strands. Braid your strands regularly three times, beginning from the right strand. When you get to the left strand (the part closest to the middle of the scalp), add more hair to it like a French braid and fold that strand to the center. This is where it gets tricky. After you've French braided your left strand (now center), drop the right strand and let it fall down. Pick up another small section of hair next to where your original strand fell—that's your new right strand. Repeat this process—French braid the left strand, drop the right strand, and pick up an adjacent new piece. Gradually cascade the style towards the middle of your head. Once you've reached a comfortable point to stop your braid, secure it to your scalp with bobby pins. You don't have to pin up your hair perfectly in this section since you'll cover up the pins with a hair accessory later. Braid the remaining piece of hair left from your cascade into a fishtail braid. Not sure how to create this mermaid-inspired style? It's easy with this helpful fishtail braid tutorial. Secure the braid with a thin hair tie. Add a cute bow or flower to hide your bobby pins and give this look some extra hair flair. Secure your barrette tightly to your scalp and braid for a firm hold. Take the extra strand of hair on the opposite side of your face and pin it back into the flower barrette so it blends in with your cascade. Spritz with a light-hold hairspray, and you've got yourself a beautiful and romantic summer hair style! If you love the waterfall braid as much as us make sure to upload a photo once you've tried this gorgeous braid!